From the beginning there were objections to the finance concordat. 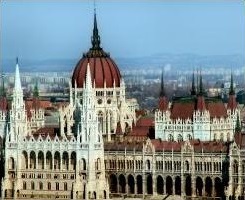 Yet, despite these, the concordat was ratified by Parliament, in 1997 in “the most beautiful building of Hungary”. Both the non-Catholic churches and one of the coalition partners of the ruling Hungarian Socialist Party (MSZP) tried to sound the alarm. Together with the other churches, the Alliance of Free Democrats (SZDSZ) objected to the fact that the government had prepared the concordat without prior consultation with the non-Catholic establishments, violating the equality of the religious bodies. The Free Democrats even warned of what was soon to come. They objected that, according to the agreements, the state may amend taxes imposed on churches only with their consent, while they can do so unilaterally with businesses, organisations, and associations. With this, they pinpointed one of the major objections to concordats: once ratified, they are removed from democratic control — forever. Within ten years this danger became apparent to all. In April of 2006 a coalition once more led by the Hungarian Socialist Party (MSZP) was re-elected on a platform promising economic “reform without austerity.” However, this was not feasible: by the time of the election the budget deficit had ballooned to over 10% of annual GDP (the largest in the 25-nation European Union) and needed to be brought down towards 3%, in the hope of eventually qualifying for adoption of the Euro. Hungary's current account deficit, the broadest measure of an economy's trade performance, was not much smaller. The stock market in Budapest plunged and a prominent American economist said that "Hungary is an accident waiting to happen." Faced with this fiscal impasse, the government naturally thought of the huge payments flowing to Rome. After this setback, the Minister returned home and in early September 2006, his Government announced the European Monetary Union Convergence Plan. This was a series of austerity measures to try to reduce the deficit in order to eventually qualify for the Euro. By the end of the month the hardship this imposed had led to rioting in the streets of Budapest. Then in the April 2010 elections the Vatican saw its chance. A conservative and Catholic coalition (Fidesz and KDNP) of gained the two-thirds parliamentary majority required to change the constitution. The new constitution enshrines key Catholic doctrines outlawing abortion and permitting discrimination against gays. Needless to say, the Vatican no longer faces any opposition from Hungary over the onerous financial concordat. 1. “Constitution Watch”, East European Constitutional Review, [New York University School of Law] , Volume 6 Number 4, Fall 1997. 4. “Education minister returns empty handed from Vatican trip”, Hungary Around the Clock, 1 August 2006.